Northeastern alumna Sarah Campbell recently earned her Master of Fine Arts (MFA) in Information Design and Visualization. Her thesis focused on how data visualizations can appeal to emotions, and how advocacy groups can use data to communicate their causes. Sarah joined the Northeastern community after earning her undergraduate degree at The University of Minnesota – Twin Cities and completing a two-year quantitative program at Bank of America. Tell us about your recent thesis, rhetoric of pathos in visualization. 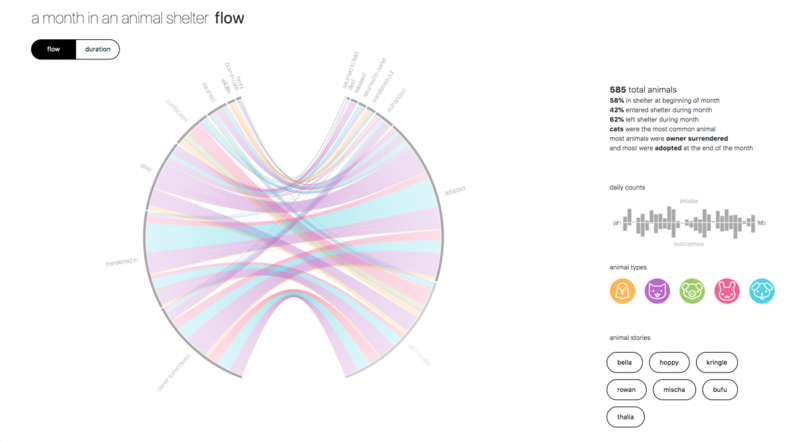 My thesis investigated how data visualizations can appeal to emotions. This research gave me the opportunity to put my statistics background to the test by running an empirical study, where I tested if filtering the data shown changes someone’s response to the visualization. I chose this topic for two reasons. First, in my information design theory course, my professor recommended I study the rhetoric of design and visualization, which considers visualization as a persuasive form. Through this research, I learned how visualizations are not objective and I wanted to explore this idea deeper. The second reason was to better understand how advocacy groups can take advantage of data as a part of their advocacy efforts. There’s an increased interest from these groups to communicate their causes using data, but they often struggle to capture the data or lack the skills or funds to analyze and visualize the data. Pins from thesis exhibit on display in Gallery 360. Where did you find the data that you used? A motivator in my thesis research was how advocacy groups can use data to communicate their causes. Causes I’m personally invested in are animal welfare and pet adoption. Collecting animal shelter statistics at a national level is a very recent initiative to use numbers to help save more lives of homeless animals. I took this opportunity to use this collected data from Shelter Animals Count to represent and communicate the issue in numbers. This is the data I used in my empirical study to show that not every animal has a live outcome. For my thesis exhibit, I took the same cause but represented it in a more creative, engaging way with data from the local shelter Animal Rescue League of Boston. In undergrad, I studied both art and statistics. I always enjoyed being both creative and analytical, but I never knew how to combine them, so I explored these interests separately. Once I graduated, I entered a two-year quantitative program at Bank of America. When I was there, I was a part of some really interesting analytical efforts, but I found an untapped potential to visualize those efforts. Also, I missed being creative. That’s when I found the Information Design and Visualization master’s program at Northeastern. It was my opportunity to develop my design skills and merge my creative and analytical interests. It couldn’t have been a better fit! I’m temporarily working on three research projects, two of which are through Northeastern. Next, I’m hoping to find a full-time data visualization role either in non-profit work, research, or journalism, where I can communicate data about important issues. Sarah’s thesis exhibit on display in Gallery 360.